I figured it would be interesting to those that have followed along my little high school football odyssey this year to give some numbers and some final thoughts. I’ll start with some statistics before getting into my opinions of the games. In total, I’ve seen 56 high school games this year. I’ve seen games in 12 different states. I’ve seen games in 21 different venues in 21 different towns. I’ve seen 14 state championship games, 18 state semifinals, and 5 other playoff games. In games I’ve attended 2,727 points were scored. There were only four shutouts. I’ve seen 104 different teams play. Only Steubenville, Akron Buchtel, Shadyside, Huber Heights Wayne, Woodland Hills (PA), Clairton (PA), South Fayette (PA), and North Allegheny (PA) did I see twice. Not one team did I see in their regular season go on to win their state title. Huber Heights Wayne, Akron Buchtel, and Meridian (MS) came the closest to winning their respective championships. All three lost their title games. Of the 56 games, two games were not 11-man football. Those being the 9-Man semifinals in Minneapolis. The most games I’ve seen in a weekend were 16 (Minnesota semifinals and Wisconsin finals). In Weeks 1 and 3, I didn’t see any games anywhere. Although, I almost got to see a game in Week 1 in Denver. I posted these basically on the end of the Texas Week 16 post, but will update them, and after consideration alter a few here. I have to bump Pennsylvania down after their miserable championship game showing this past weekend. Only one game had over 3,000 in attendance and that was thanks to a local team. The crowd counts were pretty accurate as the stadium held roughly 13,000-14,000 and was never even half full. The WPIAL finals were sparsely attended, despite the teams all being within close driving range. The Kennedy Catholic home game was about what I expected. The Cochranton game was thoroughly enjoyable for a small school playing for the love of the game. Their little 800 or so seat stadium was overflowing with fans and they were into it the entire game despite coming into the game winless. Texas wins easily based on their playoff showing. For regular season matchups, the OHSAA is about even, but the turnout for the playoffs is astronomically high. They don’t just love their high school’s football team. They just love high school football, period. And it shows. Denton Guyer and Denton Ryan played a doubleheader and SMU’s stadium was a great choice of a venue. Longview and Wylie had to travel a bit, but were well represented. Utah played their state semifinals on a Thursday and Friday, starting at 11am and the Friday games I was at were well attended. Salt Lake City Highland played the first game and had a great crowd, and not just students (who you would believe preferred the game to a day of school). Even the all Catholic school game in heavy Mormon country had a decent crowd for a 3A game. It was a fun day at Rice-Eccles Stadium in Salt Lake City. Minnesota came in at #5 for their all-day event. Every state semifinal and final are played at the Metrodome in Minneapolis. Some teams had to travel a long ways to attend the game. There was bad weather on the Saturday evening games to affect turnout. And with the little 9Man, 1A, and 2A games dragging down the numbers, they still averaged over 2,000 a game each day (of course skewed by the 4A and 5A schools bringing in the crowds). The crowd handled the event well. It was a first rate operation all around. The 9Man games at 8AM had roughly 300 fans per side. Not big crowds by any stretch. But it takes a hearty soul to drive all the way to Minneapolis in a state as large as Minnesota to watch a game at 8am. Goodridge/Grygla-Gatzke had to drive 316 miles. Underwood traveled 178 miles. Cromwell had to go 137 miles. And, Lanesboro had to go 130 miles. That is dedication for 8am games. Missouri, Nebraska, and California get low mark because such large demographic areas showed such little support for the teams. Mississippi gets pegged at #11 because for being the only public high school in Meridian and one of the best teams in the state, they had paltry fan support. Sure, $8 could turn away anyone, but the team just deserved so much more. And, that brings us to Iowa. Des Moines, like all other big cities, has trouble supporting high school football. And, to an extent, I’m painting the state with a wide brush because of this one game. But, it was pathetic. The school is the largest classification and had just rebuilt a stadium that would make an OHSAA D6 school embarrassed to call their stadium. It is small. The fan support is small. It was homecoming, as well. The visiting team, Lincoln, brought very few fans from within the same city. These aren’t ‘city schools’ like other places in the country. Des Moines is just slightly behind the state average when it comes to property values and incomes. Unlike cities in the northeast. There’s no tangiable reason why they are so poorly supported. This is how I still have it pegged. Ohio gets the slightest of edges over Texas. Ohio, to me, plays a more fundamentally sound game that requires teams to play as a team and less troubled by ‘star players’ dominating (Akise Teague aside). It’s all about the team. Other states, seemed to be all about getting the ball to the fastest kid on the team and let him outrun everyone. Sure, that’s fun. And most times it wins. But, if he’s neutralized by a good game plan, it spells the end. Ohio, to me, works on tackling better than every other state. Especially the wrap up tackle. Most other states I watched seemed to emphasize brute force knocking the guy down to end the play. Texas is good. Don’t let anyone fool you. A slight mix of both. They have some great players, but also use them effectively in a true game plan. Mississippi and South Carolina just had superior athletes in the games I watched. Extremely fast. The games were rather hum-drum. It was all about outrunning the other guy. Tackling was weak, at best. But, their speed won the day. California had good play calling in the game I watched. Average to slightly better players in the game I watched. But, they had decent fundamentals and near the top of this list. Pennsylvania teams were ‘team first’, like Ohio, but their playmakers were few and far between. Game plans were rather stodgy and predictable. North Allegheny won the 4A title by completing only one pass. LaSalle also turned the ball over 5 times while getting shutout. Utah-through-Wisconsin were a mixed bag. Some good, some bad. Mostly bad. Tackling was generally brushed off by shoulder checks and arm tackles. Iowa, the game I saw, was just bad. Without the mercy rule, Lincoln could’ve put up more. North had no fundamentals, period. They were a disgrace to football coaches the world round. Lincoln simply relied on their playmakers to score, and they scored often. They too had trouble with tackling, but were saved by North’s total ineptness. It was 56-0 at the half and the only difference in the game was that Lincoln had a few players that were any good. That difference alone resulted in a 56-0 halftime lead. That’s staggering. I’ve kept them the same and shoehorned the PIAA titles in at #7. I’ve said it many times, and I’ll repeat it again and again. The Minnesota State Semifinals at the Metrodome should be on every high school fans ‘before I die’ list. They are fun to attend. From 8AM until about 10-11PM, there’s non-stop football. Ten minutes after the final buzzer, the next game is kicking off. It’s climate controlled. You get in-out privledges. Cheap tickets ($12 per day) and parking ($5 a day at the garage right next to the stadium). There’s not a bad seat in the place. The state of Minnesota considers the Metrodome the Mecca of high school football. All teams are striving to show up here. Even for the semifinal. I reiterate, it is worth the trip if you ever can. The Ohio State Finals go without mention at #2 for the support of the fans, the uniqueness of the dual-venue setup, and the trouble the teams go through to get there. Out of 120 or so schools, only two get to show up per division. It is a very big deal. The Rally was at the Wolvarena in Turtle Creek, Pennsylvania this year after being in Wheeling, West Virginia last year. The event is about the same. It was fun. Nothing really bad about it. Seeing two Florida teams was nice. However, they’ve indicated it won’t be back there next year. Rumors floating around online say the Rally will be at Heinz Field next year. Which, I would definitely attend again. The Utah and Texas semifinals had their positives and negatives. Utah gets the slight edge simply because they’re consistently there. The UIL playoffs are a rather fluid entity that change year to year. You can’t plan a year in advance for anything, for example. Texas has the in-out privledges and places to eat nearby that make the $12 ticket for two games bearable. Utah gives you three games for $10 and you can actually purchase, for $1, a roster/game sheet. Something the Texas game lacked entirely. You couldn’t leave the Utah games and reenter, but the food was good, if not for being slightly overpriced. The view of the Wasatch Mountains and downtown Salt Lake City from the site of the 2002 Winter Olympics opening and closing ceremonies. Pennsylvania gets middle marks for the two other events I attended. Both the WPIAL and PIAA finals were a let down. Neither was well attended. The WPIAL finals had no in-out rights. The food was good, but the stadium was cold that day, and it affected both the fans and players. The PIAA finals, as mentioned, had sparse crowds with little enthusiasm from non-partisan fans. Venue is old. Parking is the saving grace there. The Herbie was soulless. Ohio Stadium just doesn’t project well. It was nice weather, which was part of the problem. The sun was unrelenting for the early games. The interstate games had little intrigue to me. The ending of the Dwyer-Glenville game wasn’t hashed out well and made a mockery by ESPN. Tickets were $15 for two games (overpriced) and parking, was a bear. I’m not really looking forward to the title games at Ohio Stadium. And lastly, the Wisconsin finals. Take the worst of all the venues and you have the Wisconsin finals. No parking (a paid shuttle for $5 was required in addition to $6 parking). The ticket was $8 with no in-out, or $12 with in-out. Food was overpriced. The stadium was frigid. Crowds were very sparse. Just a disheartening afternoon. This is how I document games (date, sport, matchup, venue, city, state; the * are playoffs or ** are finals). Only blowout on the list is White Deer-Memphis. I only saw one overtime game all year (Juan Diego Catholic vs. Judge Memorial Catholic in Utah). I saw a 17-point comeback in Guyer over Longview and a 24-point comeback in Clairton over Taylor Riverside. 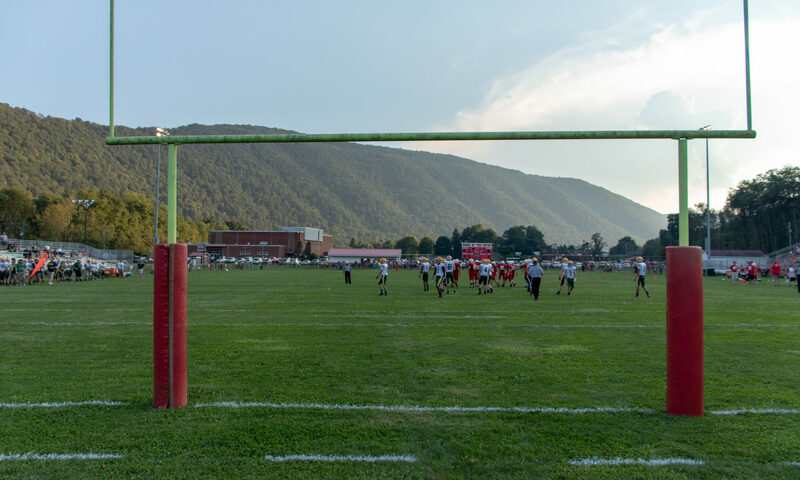 My favorite games, regardless of outcome, are the smaller teams playing in rural areas. Of which I generally don’t get to see too often. Iroquois-Cochranton (PA) and White Deer-Memphis (TX) are the two I look back fondly at this season. All three Texas games made the list. Mountain Crest-Bountiful was a shootout with one team always coming back to match the other. #1 is definitely the first on the list. A 56-0 halftime lead that invoked the mercy rule. In Iowa, the mercy rule basically states the clock does not stop for ANYTHING. Even official time outs. Once the quarter began, 12 minutes later it ended. After the break, 12 minutes later the game ended. Might as well just call the game final. Throw in all the surrounding atmosphere, and it was pretty bad. The Conneaut Valley-Kennedy Catholic game just had a horrible atmosphere and was one sided. Kennedy Catholic’s stadium is wooden, falling apart for brand new, in the hot late summer sun, and just a bad experience. And then three state championships. Delphos St. John’s and Youngstown Ursuline both won in a blowout that was over before halftime. Cold and unforgiving. Not worth sticking around for either game. I left shortly after halftime of the Ursuline game and in the fourth quarter of the St. John’s game. The West Catholic game had its moments. Like, South Fayette’s first drive that led to a touchdown. But, West Catholic just was too good and the game wasn’t in doubt after it was 20-7. In perspective, the worst team, according to Calpreps.com is #14719 Cuba (NM). For a while, Memphis was ranked only a few ahead of absolute worst. Yet, I still rank that game the best ‘single game’ I saw this year. What’s funny is that up until this year I had only seen a grand total of 100 high school games in my life. Generally only a handful of home games a year. Including a few years where I didn’t see any because work always conflicted and I had, remarkably, forgotten how much fun they were to attend. But, alas, here I am. It’s been a fun year. I doubt I can duplicate the experience next year. But, I will certainly try. I will also try and get further awway from the cities. The best high school football environments are the furthest from the overshadowing lights of the city. As you may or may not have noticed, but back when I wrote this I counted 56 games. Today, however, I only acknowledge 55 games for 2010. Why? Well, it goes in how I count games that I’ve attended. Over time, my standards have changed. 4. Must not leave early just to attend the end of another game. Basically, if I see at least half a game and leave early, I would count it. As I did when the Niles McKinley-Girard game was postponed several times due to lightning. However, we just went home. My general thought is to always stay at a game until its conclusion. This has been my general standard since about 2014 when I attended 127 games. In fact, it was very rare that I even missed part of any game that year. The first quarter and change of the Barren County Bowl, and some kickoffs due to traffic/ticket lines. Prior to that, my rules were basically: See a large majority of the game, minimum. Leaving early still generally not counted. Though attending the end of another game did count. Since only one of the three earlier criteria counted. So, for instance, I’d leave Greenville and head over to Reynolds to see them finish up against Grove City. Or the Sharon game heading over to Farrell. Or leave Steubenville to see the end over in Richmond for Edison or Wintersville for Indian Creek. However, back then, the standard I used wasn’t nearly as firm. Back even further in 2005-2009, there was a time I left Steubenville after the final whistle, drove to Indian Creek, watched the second half of the third quarter against Linsly and most of the fourth before ducking out. Then driving over to Richmond, though I missed the end of that game. I still counted Indian Creek. And still consider it today as a game I ‘attended’. Another instance, was attending a game in Bellaire between St. John Central and Weirton Madonna. The game was a dud, but I had hurt myself and just felt like going home. After getting to the car, I felt a bit better, and we drove, instead to Bridgeport to see their game against Bishop Rosecrans on a Saturday afternoon. I wish in retrospect I had just attended that game. 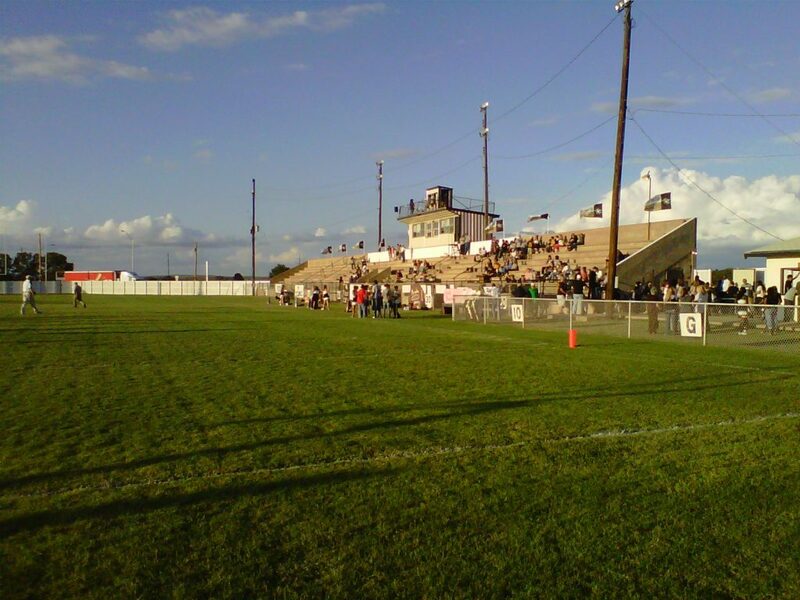 In years later, I did go back there for their Saturday night game against Valley (WV). However, I do count both because I saw a half of both games. The kickoff of one, and the finish of the other. I didn’t intend to originally leave one early to attend another. However, I did leave a Bellaire St. John Central game at their home against Toronto and go over to Bellaire’s Nelson Field to watch the end of their very close game. The drive is about a mile. Though, I did leave early. I count both games because my standards were looser back then. But, that brings me to the 2010 season. I rented a car in Gary, Indiana in the morning and drove straight through to Madison, Wisconsin. It was a long trip and I knew I’d miss the start of the first of four games that day. Paying cash tolls in a rental slowed me down considerably compared to using EZ Pass. I also stopped once for gas/store before arrival. Now, back then smart phones weren’t all that smart, and I followed the WIAA directions to the parking lot at the arena to take the shuttle. Big mistake. Because the shuttle was waiting for more fans for the next game, they wouldn’t leave. I sat on the bus, listening to the radio call. Hoping that the game would last long enough for me to arrive in person. The bus ride was not short. When I arrived at the parking lot, the fourth quarter had just began. At 11:02, Gilman scored to make it 35-0 and invoking the mercy rule. However, at 9:35, Catholic Central scored to stop it. But, while still sitting on the bus, Gilman had scored again to make it 42-7 with 7:45 left. After that, the clock moved quickly. And the bus didn’t. The game was STILL going on, barely, as we parked near the gate and I rushed over to buy my ticket. Wisconsin sells two different tickets. $8 for a ‘single game’ ticket and $12 for an all-day ticket. The all-day ticket lets you leave and reenter. The single game does not. The ticket seller asked if I wanted ‘re-entry’ and I said no. So, my ticket stub for the day said “Game 2”. This is where my decision fell on whether to count this game. Because somewhere behind him, through the concrete, the game was still being played. And as I rushed in, Catholic Central scored one last fruitless touchdown on the last play of the game. A play I didn’t get to see. But heard as the Gilman fans cheered their win and Catholic Central fans cheered their final score of the season. If there was even one more second left. One kickoff or PAT that i could witness in person. I think I would have counted it. However, at the time I did. But after a couple of years it gnawed on me that I counted this as my 35th game of 2010. Mostly, because I wasn’t sure if I’d see another game that year. So, the four in Wisconsin on Thursday, six on Friday and six on Saturday in Minneapolis would put my right at an even 50. So, at first, I was determined to count it. I was there. Where I was supposed to be. I heard it all. I was in the stadium as the final play took place. But I didn’t see it. Should I count it? And then I saw two more games the following week in Dallas. And four more games in Pennsylvania after that. So, with 56 games, hitting that 50 plateau no longer held the ‘wow’ factor to me that I had just seen 50 games. And with how many games I’ve seen in the seasons since, 50 games is nothing. But, I still kept it listed. For quite a while. After my second year seeing 100 games (and yes, not all of them are every second of every game, as I’ve mentioned above), I decided to retire the WIAA Division 7 Championship Game from my list. I was there, but I didn’t see it. I attended it, I could argue, but it didn’t really count. And so, that’s the story of the game I attended, but didn’t watch. And so, eventually, stopped counting it altogether.